Letters. When we hear the word, nostalagia hits us. I know emails are good and so are the instant messengers, but receiving any letter just makes me happy , but it is usually a bank statement or some tutorial advertisement. Sigh! 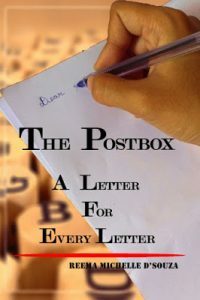 The author here kept me hooked to her 30 letters because it was heartfelt and humble. The author is a blogger and the eBook is a collection of her posts from the April A-Z blogging challenge. Where tge first post starts with a letter addressed to Anne Frank and then a Book and so on till Z. She writes letters to people and things that are important in her life and with whom she has grown in life. The book includes letters to Anne Frank, her friends, soul sister, books and many more similar things. The book keeps you hooked because of the great content and the curiosity as of to whom or what the author must have written when she came to the letters X,Y and Z.
I finished the book in a single sitting and it was worth the time. The language is simple and subtle. She has kept every emotion and the essence of letter alive. You could read the author’s book here. HEy I remember reading her interesting posts during hte Ato Z challenge. I compilation of all 26 seems interesting.!! !